Beautiful White by Vera Wang organza wedding gown. Dramatic bias cut organza tiers with rosette to finish the classic look. It has never been altered or worn and still has the tags. Has been tried on a couple times. 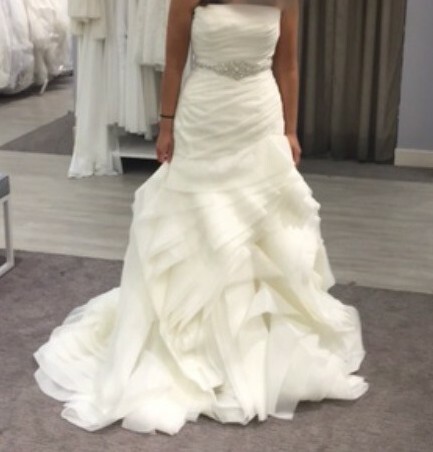 It was bought at David’s Bridal in 2016. It does not come with the belt since I never purchased it. For reference I am 5’1 so there is a lot of material to work with. I got married at city hall and wore a much simple style so that is why it’s for sale.